As a 501(c)(3) nonprofit organization, ASAN relies on your donations and support to carry out our work. 2016 marks our tenth year as an organization and our fifth year as a formally-designated 501(c)(3), and we take great pride in the work we’ve done. 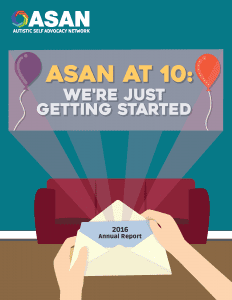 To better inform our supporters about the work that your contributions make possible, we invite you to read this year’s annual report, ASAN At 10: We’re Just Getting Started. Click here to view the Annual Report. Or, read it below. This entry was posted in Blog, News, Publications and tagged annual report. Bookmark the permalink.